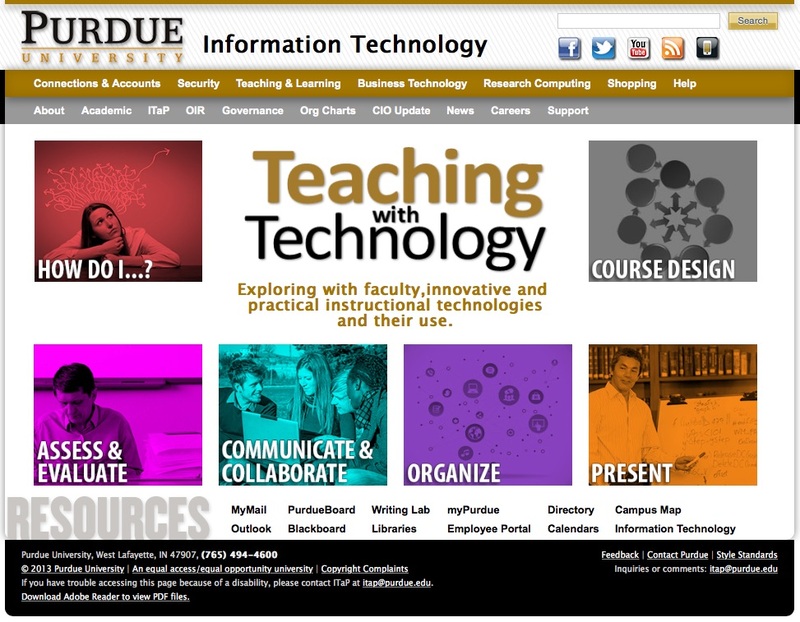 Purdue University have an impressive teaching and learning resources page which has resources about using technology tools through to a course review and design process. What I particularly like is that each of the sections – particularly in the technology tools sections – includes an analysis of how the tool might relate to principles of sound pedagogy. They use a simple set of seven principles that has been widely popularised and they use it in a consistent cyclical way. For example the page on Presenting with Digital Tools gives examples of good tools and examples of their use. It then links to Principle 3 – Encourages Active Learning, this page in turn links to a set of strategies for encouraging active learning. For example the first strategy is I ask students to present their work to the class this page has a brief pedagogical rational, examples, references and tool suggestions. Using this sound research based framework adds a simplicity to the presentation and a depth to the content. Online and blended courses present particular learning design and learning experience issues that need careful instructional design – as do face to face classes. However adequate negotiation of these particular hurdles should not be the only or even the primary measure of success or quality. This is like reviewing a play by assessing the stage design without seeing the play. are clearly important in any kind of learning design. Some of these factors – such as navigational clarity, signposting and provision of clear communication options – are particularly important in blended and online courses where there is limited or reduced direct contact with teaching staff. However, as Kelvin Thompson points out, these kinds of standards-based checklists run the risk of highlighting issues of instructional design rather than learning design or learning experience. Thompson’s Online Course Criticism method, which employs detailed narrative-based, ethnographic principles, is a much richer approach, yet it is one which is much more difficult and time consuming to implement. Although a standards/checklist approach to course evaluation and quality assurance is not restricted to online and blended courses, I think there is a tendency to resort to this method more often in assessing digital courses because the challenge of online and blended courses are seen primarily as implementation challenges not learning design or learning experience challenges. This is often because online and blended courses are transformations or iterations of pre-existing face to face courses, so the tendency is to try to measure successful adaptation, rather than focus on the new learning and teaching experience. Measuring the quality of an online or blended course design ultimately depends on providing a range of rich learning experiences. The quality of this essential learning experiences can ultimately be better assessed and assured by looking at broader frameworks such as Northumbria’s Assessment for Learning model rather than purely through markers of online fluency. 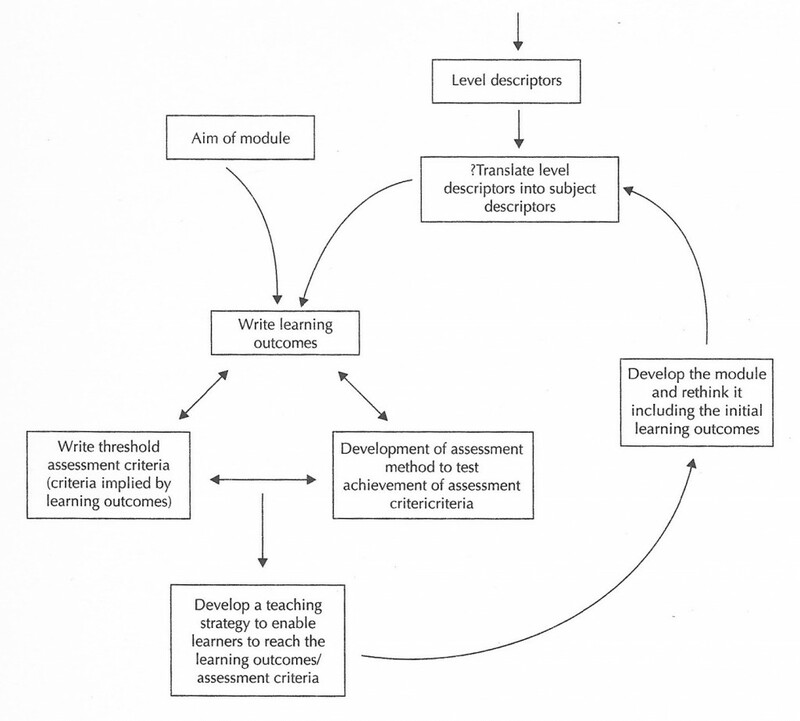 The Northumbria model, for example, outlines key elements in the way that assessment and learning tasks need to be sequenced, developed and co-ordinated to provide for vibrant interactive and long lasting learning impact. Such standards apply to any successful learning delivery environment, although how they are implemented may be quite different. 1. Does it have an emphasis on authenticity and complexity in the content and methods of assessment rather than reproduction of knowledge and reductive measurement? 2.Does it use high-stakes summative assessment rigorously but sparingly rather than as the main driver for learning? 3.Does it offer students extensive opportunities to engage in the kinds of tasks that develop and demonstrate their learning, thus building their confidence and capabilities before they are summatively assessed? 4. Does it providing an environment that is rich in feedback derived from formal mechanisms e.g. tutor comments on assignments, student self-review logs? 5.Does it provide an environment that is rich in informal feedback, eg peer review of draft writing, collaborative project work, which provides students with a continuous flow of feedback on ‘how they are doing’? 6. Does it develop students’ abilities to direct their own learning, evaluate their own progress and attainments and support the learning of others? Starting with these types of standards as the key evaluation questions will inevitably lead to an examination of specific instructional design issues that may be unique to blended or online courses, as we drill down into course detail. But these implementation specifics are not then mistaken for markers of quality they are merely diagnosed as efficient or inefficient delivery mechanisms which provide one part of a quality framework or infrastructure. I was particularly struck this week by the thoughts on “integration” covered in the Blendkit2014 readings. If students know that they can always find the details of the assignment introduced in the last class session by turning to the online modules or that they will always submit assignments via a particular online tool, students are likely to perceive the course as one consistent whole. But this is only a small part of the overall picture. The real game is crafting a story about what we are doing together. how the skills/knowledge/activities fit into the overall picture of the discipline or profession. But the next step, which is even more important, is that our students must be given multiple opportunities to tell their own story about what they are learning, and about the connections that they are making as they move through the learning modules and different learning environments. This can occur in both formal and informal ways. All my courses come with a Facebook page and this is a natural way for students to begin to tell the story of their learning experience – they are used to posting their status, how they are feeling, how they are reacting, what they are thinking. I also incorporate formal reflective self-assessments which wrap around all assignments, which begin in class and continue on line. These are linked to peer-review and peer assessments and early discussion of marking criteria that results in a collectively devised and owned marking rubric. Telling the story of our courses means constantly retelling that story. Good learning design is only the first chapter of the story, it introduces some of the characters and gives us a sense of the plot but like all good stories it foreshadows rather than prescribes the rest of the narrative. The 80 students in the class divide up in groups of four to write a white paper proposing policy on a scientific issue, such as supporting wind energy. Then they must produce a “persuasive yet accurate” short video to build momentum for their policy, says Mr. Fosmire. The professor says he has been surprised by how much time and energy the students invest in the videos, which have included mock newscasts and send-ups of popular sitcoms. Fosmire’s comments about the focus and energy that this type of task produces in students is very familiar to me and I have written about this in the context of student blogging projects. As Seymour Papert has argued, when we ask students to “construct” something, they often really engage with the artefact in a deep way and this results in a deeper learning experience. The blend in blended learning is a very rich metaphor. It’s not just about blending face to face and technologically mediated learning it’s blending a whole range of learning experiences and interactions. It’s blending communications, it’s blending connections and it’s facilitating and encouraging blended – or integrated – meaning making. The four models presented above share a common attribute of blending the concept of educator expertise with learner construction. The concerns of instructivist and constructivist education are addressed in the focus on connection-forming in learning. Whether seen as master artist, network administrator, concierge, or curator, the established expertise of the educator plays an active role in guiding, directing, and evaluating the activities of learners. It is this facilitating, connecting role, which the different blends of the blended learning process bring into focus. I was struck that this movement in education, from teacher as instructor to teacher as facilitator of connections is very similar to the shift in journalism from journalist as authoritative deliver of news to journalist as key participant in a broader convergent news ecology. Cindy Royal a journalism educator has recently written about why journalism educators need to think more seriously about what it is that technology is doing to news and news making. She writes that the major value of news comes from it’s being shared. So one of the major tasks of a journalist is to make it sharable: to facilitate the new web enabled participatory cycles of communications. This involves both a commitment to this new model and an understanding of the multiple technological means available to make it happen. So it’s both important to emphasise that this process is about more than technology but it’s equally important to ensure that the possibilities technology can enable and the full dimensions of it’s impact are also deeply understood. The key question that the affordances of the web forces both journalists and educators to ask is: how do I make everything I do more sharable? Importantly this isn’t just about product or information it means making the processes of journalism and education transparent and sharable. Changing from a delivery model to a co-creation model. Changing from a simple transmission model to a complex ecological model. Journalism and education are both industries that are facing technological disruption a process management guru Clay Christenson has described as “disruptive innovation”. Both industries are torn between innovators who have embraced the new models which technological web-based interactions make possible and those who either ignore or actively resist them. It is only in recent years that there has been a broad institutional realisation in both the media and the education sector that these changes are not a matter of choice they are a matter of survival. convergence represents a shift in cultural logic, whereby consumers are encouraged to seek out new information and make connections between dispersed media content. The term, participatory culture, is intended to contrast with older notions of media spectatorship. In this emerging media system, what might traditionally be understood as media producers and consumers are transformed into participants who are expected to interact with each other according to a new set of rules which none of us fully understands. Convergence does not occur through media appliances – however sophisticated they may become. Convergence occurs within the brains of individual consumers. Yet, each of us constructs our own personal mythology from bits and fragments of information we have extracted from the ongoing flow of media around us and transformed into resources through which we make sense of our everyday lives. Blended learning does not occur through media appliances – however sophisticated they may become. Blended learning occurs within the brains of individual learners. Blended learning does not occur through media appliances – however sophisticated they may become. Blended learning occurs within the brains of individual individual learners and in and through the participatory communities that they gather around themselves. ‘‘Infrastructure’’ models involve components such as mixed modalities, development time, cost factors, combined programs, multiple locations, production issues, multiple institutions and landscape considerations. ‘‘Learning environment’’ models are based on issues such as interaction, constructivism, communication, communities, learning management, learning effectiveness, cognition and performance support. ‘‘Added value’’ models are driven by constructs such as synchronicity, enhancement, presence, access, reusability, transformation, replacement and process emphasis. Many blended learning models organize themselves with space as the basic frame for education, where technological assets augment or supplant place-bound education. In these models, blending becomes a mix of place versus non-place events. I am currently doing one of Canvas.net’s MOOCs: Blendkit2014, a course on blended learning. I have looked at MOOCs before and dipped my digital toes in the learning stream but this time I want to engage with as much as possible to see what the MOOC experience is like from the inside. It will also give me an opportunity to think more about Blended Learning which links well with a number of my current curriculum projects – my redesign of first year journalism courses at UOW and our wider curriculum renewal project. This is my first blog post for the course and responds to the first reading about definitions and design principles in blended learning. Blended learning is not simply adding an online component to a face-to-face course. Technology in a course should be used wisely – to facilitate student learning. Technology should not be used just to show off technology. Excellent opportunities exist for teachers to make learning interactive, dynamic, and fun when used properly. The technology aspect of a lesson should be like a good baseball umpire – it (like the umpire) is good if it (he) goes unnoticed. I agree that learning design is learning design and needs to be focused on learning not on methods or modes of delivery, however I don’t think this means making the technology or modes of delivery invisible. I think one of the reasons that we engage with blended learning is precisely to engage with technologies, and part of the educational design is to enhance digital literacies in the same way that, for example, oral literacies are developed in classroom presentations. I understand the underlying cautions in the blended learning literature which wants to focus on learning outcomes not technological delivery but I think that this runs the risk of underestimating the importance of thinking very cogently about the technological delivery aspects. There are several reasons why the technology should not remain invisible in either our design thinning or in our student delivery. Firstly engagement through digitally mediated forms often requires explicit scaffolding, so it is necessary to get students to think about technological processes in order to get them to effectively use these modes to facilitate higher order outcomes. Secondly digital literacy needs to be embedded across the curriculum as a key learning outcome and not expected to occur either by osmosis or through specific subjects about technology. Thirdly making learning processes and modes explicit – whether this means talking explicitly about collaboration and team work in face to face classes or talking explicitly about technological and digital skills in online classes – is an important element of reflective practice which is essential to deep learning and the development of adaptable skills.